The Ideal of the University is a lucid, comprehensive analysis of the rationale, principles, and presuppositions that make contemporary universities what they are. The book begins with four sharp, carefully delineated models of a university. After analyzing such controversial issues as the role of grading in the university and the "myth" of value neutrality. 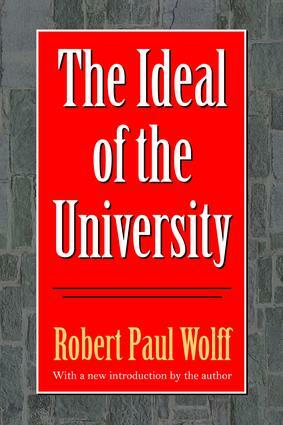 Wolff turns to the crucial question of how the university should be governed. He argues for a radical reconstruction based on a "social contract" that would place ultimate authority in the hands of the faculty and students. The book concludes with a series of "practical proposals for Utopian reform," including such provocative recommendations as a variable-length, ungraded undergraduate program and elimination of the Ph.D. degree. In his introduction to this new edition, Wolff expands upon his original speculations to argue in substantive detail for the liberating potential of the liberal arts. Drawing upon Freud and Marcuse, Wolff proposes that literature, art, and philosophy embody a promise of gratification that engenders a negative critique of the social and cultural status quo. The rationale for the liberal arts university is society's need for a reservoir of critical thinking that is the motor of social, economic, and political progress. Elegantly written and passionately argued; The Ideal of the University is essential reading for educators and sociologists. How Should a University Be Governed? Why Should a University Be Governed at All?